At Koyo, we’re so much more than bearings. 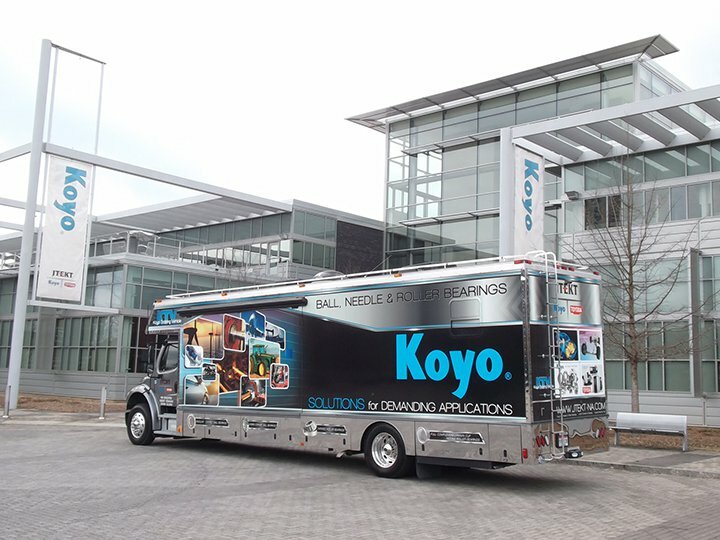 In fact, our goal is to go even further by offering services, training and engineering support that far exceeds our customers’ expectations.To that end, we are proud to introduce our newly upgraded Koyo Training Vehicle (KTV), which allows us to provide advanced onsite bearing education and sales training. This state-of-the-art vehicle is designed and equipped to provide world-class bearing education and training…at your convenience. The new KTV is built into a 40-foot vehicle and features slide-out sides which open to create a classroom large enough to accommodate 25 students at once. This unique mobile training facility offers maximum flexibility and comfort for any training session. Inside the temperature-controlled classroom, students will have access to critical information about proper bearing installation and removal, lubrication,specifying, failure prevention and analysis…all in a quiet, comfortable atmosphere. Koyo personnel provide hands-on training that’s fun and practical, including an installation bench where students can perfect their skills at mounting and removing bearings. Where Will The KTV Go Next?